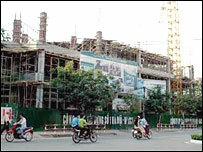 Vietnam is expected to become a member of the World Trade Organisation next week. The deal will help a country once regarded as a backwater to catch up with its economically successful neighbours. 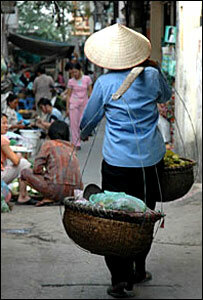 Vietnamese traditions are still in evidence despite new wealth. Out there in the Mekong Delta, at the bottom of long thin Vietnam, Hien Van Le is very, very proud of his catfish. Every day, seven days a week, he takes a boat across the river to look at his fish, millions of them in great ponds he has had excavated along the river bank. In the rapidly dwindling light of a sultry evening, two workers on a tiny boat struggle with sacks of feed, letting it cascade into the fishpond. The surface of the water erupts like a sudden rainfall as the catfish surface to fight for food. Hien Van Le is a returnee: a Vietnam-born plastic surgeon who practised in Japan and Los Angeles for many years. But in 2002 he came home, and here in the Mekong Delta with two local partners he started this 500-acre fish farm which now supplies 50 million fish a year to the export market. Elsewhere in the Mekong Delta, they grow rice, in profusion. A nation that had to import rice 20 years ago has now become the biggest rice exporter in the world. And it is not just food. Vietnam is exporting steel, and computer parts and now, highly skilled outsourced services, the kind on which India has built a huge new reputation. Vietnam is making waves. The Mekong catfish farmers, with two harvests a year, have their less productive American rivals worried enough for the US to impose anti-dumping duties. This is all happening in a place cut off from the rest of the world for much of the past three decades, after the end of what we call the Vietnam War and the Vietnamese call the American War. Vietnam still has a Communist government but, just as China did in the late 1970s, so in the year 2000 the Vietnamese authorities unveiled big reforms which legitimised private business and turned many state-owned firms into shareholder-owned companies. The impact has been as dramatic as the Chinese industrial revolution. Foreign investment is pouring in. Vietnam now attracts more overseas investment than India does; it is second only to China in the Asian economic growth league, and 50% of the Vietnam population is aged 35 or under. The trite way of putting it is that when they stopped making war here, they made love. The hordes of young people simply don't remember the war; they are well-educated, and very ambitious. The computer chip giant Intel this year announced it was investing £600m in a new plant to test and mount chips flown in from abroad - an investment by an international giant that opened the eyes of many other companies to the attractions of the country as a base. Intel's main man in Vietnam is Phu Than, a local who was helicoptered out of the grounds of the American embassy on the day that Saigon fell in 1975. Though he vividly remembers the feeling of a new life beginning on that chaotic morning, in the year 2000 he came back. More trade will bring new wealth to Vietnam's young population. Communist or not, Intel's chairman admiringly remarked that the experience was very similar to the welcome Intel received from the authorities in Ireland, a place in which it has now enthusiastically invested billions. Another incomer is Atlas Industries, an outsourcing firm run by an Englishman called Joe Woolf that uses cheap Vietnamese technicians to make construction drawings and 3D computer simulations for architects far away in Britain and Australia. This is outsourcing driving up the skills chain. It is a far cry from the call centre mentality. The youthfulness of the Vietnamese cities is particularly apparent in the millions of mopeds now scooting round Ho Chi Minh City, the current name for what used to be Saigon. It still bears the mark of elegant French colonialism, but as I wove past the Reconciliation Palace and the elegant municipal theatre in a tooting ballet of motor scooters, darting and weaving like the feeding catfish in the Delta, I had an ugly premonition. Economists say that soon - maybe as soon as next year - the income of Vietnam's city families will reach the size when they will start to buy cars. 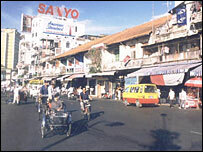 And if that happens, then the flow of the hordes of mopeds will be replaced by logjams, and the human scale and amiability of this low-rise city will be shoved aside by angry people in static tin boxes and looming skyscrapers like the other cities of Asia. The authorities have big plans for public transport, and as this is still a centrally directed economy they may be able to get their way. But cars have a habit of winning people's hearts and minds, in a way that the American military never managed to do, back in the 1970s. From Our Own Correspondent was broadcast on Saturday, 6 January, 2007 at 1130 GMT on BBC Radio 4. Please check the programme schedules for World Service transmission times.